Ukraine stresses the absurdity of Russia’s claims that the Ukrainian forces were to blame for the tragic death of an OSCE Special Monitoring Mission’s observer, a U.S. citizen, in a militant-controlled area in Donbas in April 2017, Permanent Representative of Ukraine to the International Organizations in Vienna said, addressing the meeting of the OSCE Permanent Council September 28, 2017. The Ambassador stated that the safety and security of the OSCE SMM “must definitely remain a priority for all OSCE participating States, which established this Mission. “One of these States, the Russian Federation, tries to escape its responsibility for serious incidents with the SMM monitors in certain areas of Donetsk and Luhansk regions controlled by its hybrid forces, including the tragic incident of 23 April 2017 near Pryshyb,” said Ukraine’s envoy. “Today we heard the absurdity of so-called conclusions drawn by Russia from the report of the external investigation into the incident. Evading responsibility was the aim of the Russian side when it announced its idea on the deployment of the UN peacekeeping operation, which would be limited only to the protection of the SMM monitors,” Prokopchuk said. As reported earlier, Russia’s envoy to the OSCE at the Permanent Council’s meeting Sept 28 blamed Ukraine in the death of an OSCE monitor in the occupied part of Luhansk region. UNIAN memo. On April 23, 2017, the car of the OSCE mission patrol was blown up on a mine outside the village of Pryshyb in the part of Luhansk region controlled by Russian proxy forces. An OSCE observer, U.S. citizen Joseph Stone was killed in a blast while observers from Germany and the Czech Republic were injured. Right after the tragic incident, the Kremlin-controlled media have resorted to exploiting the death of an OSCE monitor for propaganda purposes, accusing Ukraine military of shelling the site where the landmine hit an OSCE patrol vehicle and claiming that Kyiv was impeding the investigation. The Ukrainian Defense Ministry responded to the accusation and dismissed it as groundless and fake. And interactive map developed by the Ukraine Crisis Media Center that tracks fighting in the occupied eastern territories shows that Ukrainian armed forces have not shelled any areas around Pryshyb, the village in Luhansk oblast where the OSCE vehicle hit a mine. On Aril 23, all shelling in Luhansk province took place in the area of Stanytsia Luhanska and Valuiske, areas held by the Russian-backed militants, according to Stopfake.org. 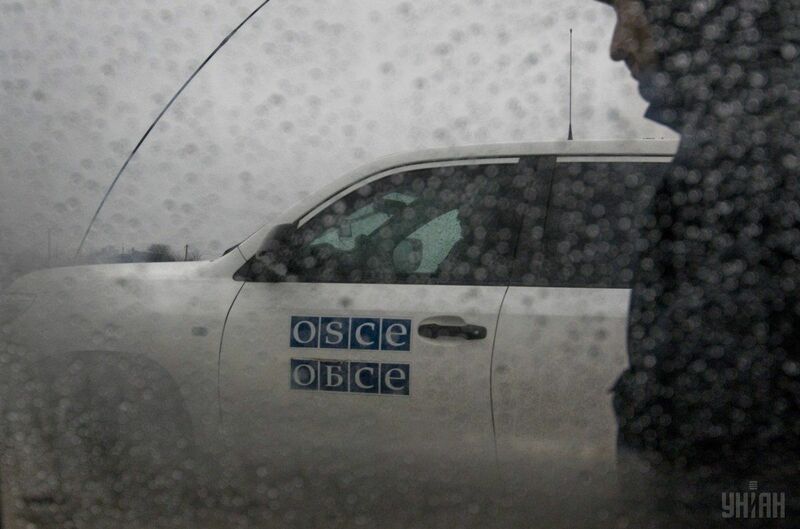 During an April 24 briefing about the mine incident, OSCE Ukraine Deputy Chief Monitor Alexander Hug did not mention any Ukrainian obstruction into the investigation, nor did he say that the area was being shelled.